It's taken two hundred years but this cops past is about to catch up with him. Nick: I am what I am, and I don't think Betty Ford takes vampires. A good yarn that keeps you guessing. This is my favourite movie. I know that sounds pathetic, but the first time I watched it, it kept me guessing. Most movies are predictable. Of course it only worked the first time I watched it, but I never knew if the vampire was good or bad until well into the movie and thoroughly enjoyed the whole movie. I was disappointed at that time to find it was a pilot which of course leaves room for more at the end. I thought the music was great and actually tracked down (it was of course by then getting old) some of the CDs. 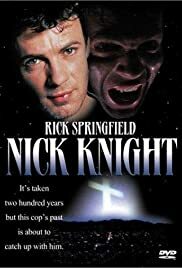 It was disappointing that 'Forever Knight' the series that followed didn't keep to the high standard set by this pilot, although I've still watched all the episodes several times. Anyway, for what it's worth, I think this movie is worth a look.